High, high in the Rila Mountain, where the forest touches the sky and the prayers to God have the greatest power, is the Rila Monastery. Most likely, we will find it difficult to find a Bulgarian who hasn’t visited this Bulgarian heritage at least once in his life, but if there is someone, then the story that we are going to tell, is just for him. We don’t pretend that we will be completely comprehensive, because describing precisely this Bulgarian sacred place with words, putting it mildly, is a mission impossible, but we will do our best to introduce in brief to you the history of the Rila Monastery. 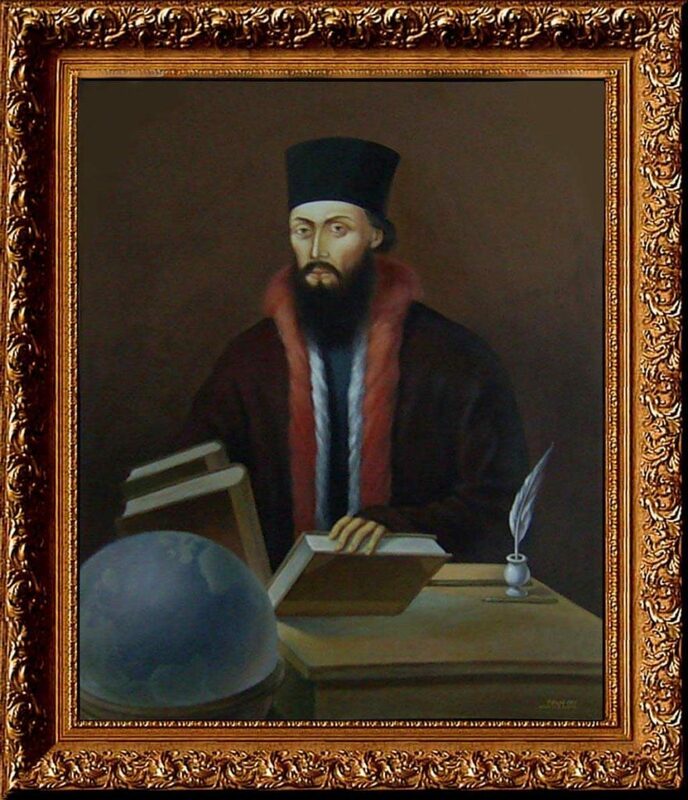 The legend tells (and the historians believe), that Ivan Rilski is the founder of the monastery. The monk came to these lands in the 30-s of X century, and devoted himsleft to a life of hermitage, fasting and praying, far away from the secular vanity. The saint found a cave near the place where the present monastery is located, and he spent there the last five years of his life. A few months after his death, his relics were collected and moved to Tarnovo. This has happened during the reign of tsar Peter, and most probably thanks to this tsar, Ivan Rilski was canonized as a saint. In the following years, the relics of the saint were moved many times, until finally transferred to the church in the Rila Monastery, where they can be respected today. 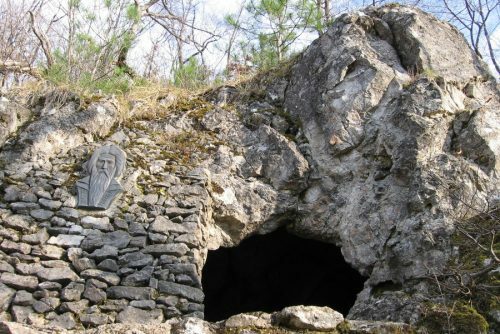 In the immediate vicinity of the cave in which St. Ivan Rilski spent the last years of his life, his followers built a small, stone church that is still there today. After the death of the saint, his followers decided to build a monastery near the place where the monk lived the last years of his life. They chose the current location for two reasons – it was much more secure and an anchoress was already built on the terrain. Thus, in the period 927 – 941 the Rila Monastery was built compltely. Initially, the cloister was small and quite modest, but in the XIV century the local feudal protosebastos Hrelyo Dragovol changed completely its appearance. Since the times were already uncertain, Hrelyo transformed the monastery into a well-fortified monastery complex, that could withstand attacks. At the times of protosebastos Hrelyo were built monastic residential buildings, a small one-apse temple and a defensive tower. (Of all the buildings built at that time, only the Hrelyo’s tower is preserved till today). 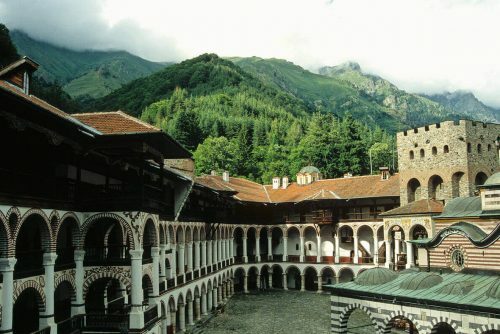 Ever since its construction, the Rila Monastery was supported by all Bulgarian tsars, who ruled the country until it fell under the Ottoman yoke. Among the greatest patrons and contributors are Ivan Alexander and Ivan Shishman, and from the time of the second tsar there is a preserved donation document from 1378, showing that the tsar donated many lands to the monastery cloister. All this support helped the monastery to become the most significant spiritual and cultural center in the country. Unfortunately, the great development of the monastery cloister suddenly stopped in the end of XIV century, when Bulgaria fell under the Ottoman rule. The years after that were years of darkness and attacks on the monastery, and in the middle of XV this sacred place was destroyed and plundered by the Turkish invaders. It took many years before the monastery began to revive from the ashes. The first „rays of light” came in the end of XV century, when with the help of donations and help from Bulgarians from all over the country, the Rila Monastery began to recover as a cultural and spiritual center. An interesting fact is that in the restoration of the sacred place were actively involved not only the Bulgarians, but also the Russian and Moldovan Orthodox churches, who made donations to the monastery not only in the form of money, but as well of books and other church accessories. The monastery exists in the form in which we can see it today since the XIX century. „St. Ivan Rilski” is the biggest monastery in Bulgaria and it is one of the most visited sights in our country. The monastery complex is stauropegial and has a unique architecture. Viewed from outside, its 24-meter-high walls form an irregular pentagon and it looks like impregnable stronghold (fortress). The cloister is located on a total area of 8800 sq. m. and includes residential, church and farm buildings. The premises located within the monastery are around 300, as 100 of them are monastic cells. Since the first step through the heavy monastery gates, the honorable visitor finds himself in a huge, stone-paved yard, and his attention immediately is drawn by the 24-meter high defensive tower. The Hrelyo’s tower is the oldest building in the monastery, left untouched ever since the establishment of the monastery. The tower was built in 1335 and in times of trouble it has served not only for defense, but as well for residential building for the monks. Most probably, for this reason, on the top floor of the tower was build the chapel „Transfiguration of the Lord”. Very close to the Hrelyo’s tower is located the main monastery church „Nativity of the Blessed virgin Mary”. The church temple was built by Master Pavel Ivanovich, as the construction began in 1834 and it was finished in 1837. The church of the monastery is a five-domed, cross-dome building that impresses with its mural paintings and wood-carved iconostases, made by masters from the schools of Bansko and Samokov. An interesting fact is that although many masters have worked on the frescoes, only Zahari Zograf has signed his mural paintings. In the monastery church are preserved the relics of St. Ivan Rilski, the miracolous icon „Virgin Mary Osenovitca” (XII century), the miraculous icon of Saint Ivan Rilski (XVIII century), and many kissing icons from XIV and XIX century. The monastery buildings are work of master Aleksey Rilets, who designed the eastern, northern and western wings. In 1833 in the Rila Monastery there was a fire that destroyed the monastic residential buildings, so master Alexey had to build them again. The genius architect and builder managed to repair the wooden parts of the monastery buildings only for 10 months, and in the restoration process were involved more than 3000 masters craftmen. 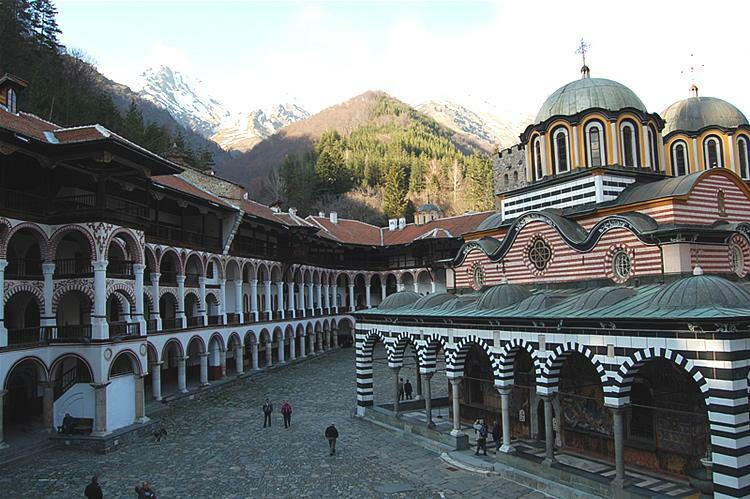 Since its establishment, the Rila Monastery has become a literary center and cultural center of the country. Behind the walls of the monastery were written books, theological and secular works, and the monks had the role of spiritual leaders. There was a school in the monastery cloister, where the monks studied not only to read and write, but also higher sciences. The head of the school was Neofit Rilski, who gave his knowledge to anyone who wanted to learn. The Rila Monastery also plays a very important role in preserving the Orthodox Christian faith, which was extremely important work, especially during the Ottoman rule. After the Liberation, the monastery cloister continued being a protector of all oppressed and gave shelter to numerous figures of the Internal Macedonian- Edirne Revolutionary Organization, such as Dame Gruev, Yane Sandanski, Dobri Daskalov and others. In 1976 the Rila Monastery was declared a national historical monument, and since 1983 is in the UNESCO list. In 1992 it passed under the auspices of the Holy Synod of the Bulgarian Orthodox Church. What else can you see in and around the Rila Monastery? Apart from the main buildings that we have already introduced to you, a good idea would be, while you are in the monastery cloister, if you spend time to see the Museum Exposition to the Monastery. Established in the end of XIX century, the museum preserved valuable models of the Bulgarian art from the period XIV – XIX century. One of the most valuable exhibits there is a wooden cross with exquisite carving, made by master craftsman father Rafael. „Magernitsa” is called the monastery’s kitchen, and in it you can see the huge cauldrons in which the monks have prepared a boiled mutton for the laity during major celebrations. The church is built specifically for cemetery rituals and normally around it are buried all monks who have lived in the monastery, and inside the temple is located the ossuary. The cemetery church was built in three stages, as the first stage began in the XIV century. „Blessed Virgin” is located in the southern end of the monastery complex. The cave in which the saint lived for five years and where he has found eternal peace, is one of the biggest attractions in the immediate vicinity of the Rila Monastery. If you decide to visit it, you just have to follow the marked 4km trail that will take you right there. In the beginning we mentioned that the followers of the monk – hermit built a small stone church near the cave itself. Well, this church is still standing there, so you can see it together with the cave. Most probably the church is built in the XIV century, but 1820 it was renewed. Through a narrow opening between the rock and the church you can go into the cave, and according to the beliefs, through it can only pass a righteous man. The legend of the saint tells that he was a healer and helped everyone who needed his help. Maybe this is one of the reasons till the present day, around the cave and in the church, for people to tie up rags hoping that St. Ivan Rilski will cure their diseases. The monastery complex is an active, male monastery that is open to visitors throughout the year. There is a parking in front of the monastery gates, so you can safely leave your car there. Around the monastery there are enough souvenir shops where you can buy something to remember, but we recommend you to view first the souvenir shop of the monastery, there you will find a great variety of souvenirs to take home as a memory of this Bulgarian sacred place. If you would like to stay for the night, the Rila Monastery offers accomodation and food. And yes, we almost forgot! The monastery cloister is famous with the best mekitsa /fried dough/ in the world and with its unique buffalo milk.